Monarch butterfly caterpillar on Asclepias syriaca at the KU Native Medicinal Plant Research Garden. Photo by Kim Scherman. 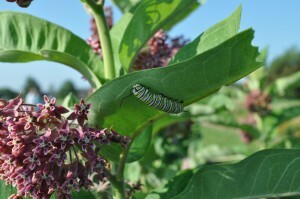 Chemists in the laboratory of Barbara Timmermann, who heads the medicinal chemistry side of our program, have discovered that a cardiac glycoside present in Asclepias, or milkweeds—a widely distributed yet poorly investigated genus of the U.S. Midwest—was found to have strong cytotoxicity against breast cancer cell lines. These findings have led to two published papers. We will continue to pursue this research. Please click on the links below for more information.